SIOS aims to set an example for how to systematically construct observational networks in the Arctic and how joint efforts provide added value to the user community. SIOS uses several means to achieve this goal. The working groups secure user commitment and impact on the process of improving the existing observing system; the data portal with its access to standardised data facilitates the integration between different research fields and nations; and the State of Environmental Science in Svalbard (SESS) report will be the ultimate tool for research based guidance towards optimisation of the Svalbard Observing System for Earth System Science. The strategic overview, optimisation and integration of the observing system is handled at the science manager level. The final decisions are made by the General Assembly, after recommendations from the Board of Directors who in turn are guided by the Science Optimisation Advisory group and other working groups. 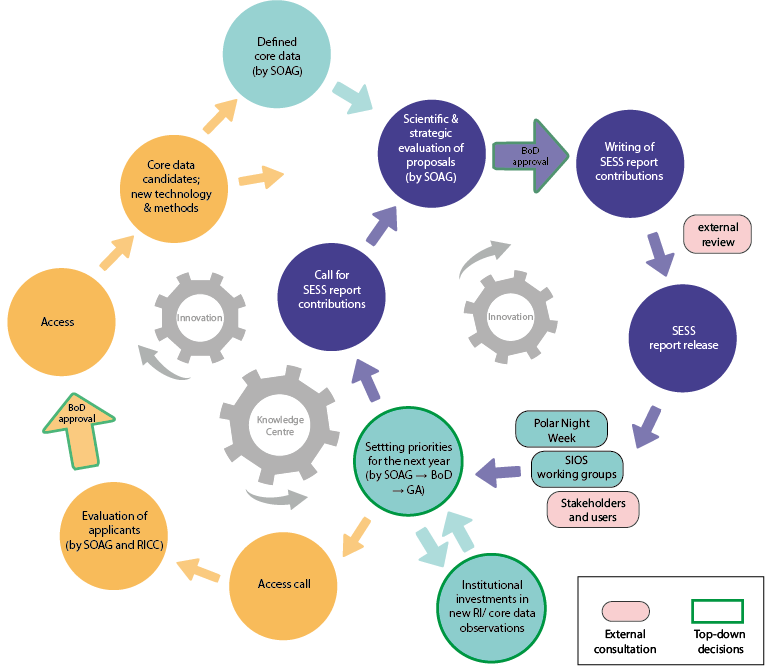 Figure: Concept of the SIOS Science Wheel, showing the development of the State of Environmental Science in Svalbard report and the Access Programme. Innovation is central in both processes in order to improve the Observing System. The teeth of the cogwheels that drive SIOS forwards are the working groups and task forces deployed by the governing bodies of SIOS. The Knowledge Centre ensures the continuous development and the annual meeting, SIOS Polar Night Week, brings the SIOS community together for science seminars, meetings and the SESS report release. SESS = State of Environmental Science in Svalbard report; SOAG = Science Optimisation Advisory Group; GA = General Assembly; BoD = Board of Directors; RICC = Research Infrastructure Coordination Committee; KC = Knowledge Centre.